25th – 27th October 2018 (please see below for the fee waiver conditions). Additionally, there is also another event in Hong Kong on 28th October which is organized by Herbert Smith and Freehills (“HSF”), DLA Piper, and BABSEACLE which is the Legal Ethics & Pro Bono Workshop (“Workshop”) — the event will take place at HSF Office in Hong Kong (no registration fee is needed for the Workshop and no limit for the attendee). 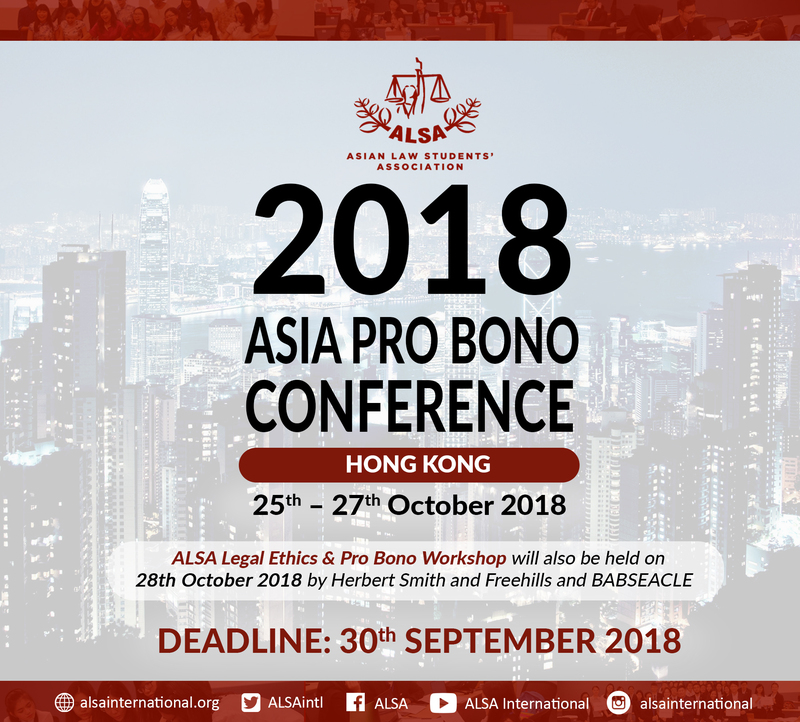 Asia Pro Bono Conference 2018 will showcase the latest from Asia in Pro Bono, including new responses to Statelessness, Technology and Pro Bono, Migrant Workers, Trafficking, Business and Human Rights, Discrimination, Starting A Pro Bono Practice and Innovations in Advocacy. Additionally, ALSA will have a panel which we will be demonstrating our strength in cultural diversity and our reach to law students in different jurisdiction. This is a very good opportunity for ALSA to exponentially develop in its outreach and outlook in pro bono arena. For this event, apart from participating in pro bono opportunities, you will be introduced to top regional/local law firms, NGOs (including various arms of United Nations and international organizations) and other interesting agencies. 2. Discounted registration fee of USD 25 (payable) from USD 550. Please contact your respective National Board officer within 30th September 2018 for further information.